Comm. Bot. Conif. Cycad. 86 (1826), nom. superfl. Stand of of mature Pehuén (A. araucana) at Primeros Piños, Neuquen, Argentina. 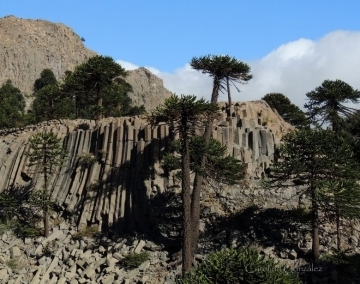 Origin and Habitat: Araucaria araucana is native to the lower slopes of central and southern Chile (Biobío, La Araucania, Los Lagos) and western Argentina (Neuquén), spanning three degrees of latitude from 37º20' to 40º20'S. Its distribution is split between the main area straddling both sides of the Andes and two other disjunct small subpopulations in Cordillera de Nahuelbuta in Chile. Total area of occupancy 392.51 km². 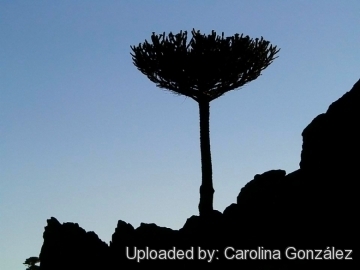 Altitude range: In the Andes, this tree occurs from the upper timber-line at ca. 1,500 to 1,800 m, down to 900 m with scattered individuals as low as 600 m.
Habitat and ecology: A. araucana occur on sandy, rocky, usually volcanic, well-drained soils, and tends to be associated with rock outcrops or stream, at altitudes where the snow stays for long. It can form relatively extensive pure stands often on steep volcanic slopes or in association with temperate rainforest species including Nothofagus antarctica, Nothofagus dombeyi, Nothofagus pumilio and Saxegothaea conspicua. 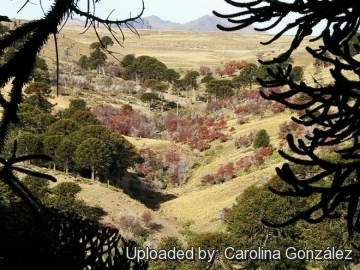 In Argentina where the rainfall is less (between 1,000 to 1,500 mm) it occurs with Austrocedrus chilensis and Lomatia hirsuta, the under-growth present with Chusquea culeou, Drimys winteri, and several species of Berberis. Both seed and pollen are relatively heavy and may not disperse over large distances, although seed dispersal may be assisted by parakeets and other animals. 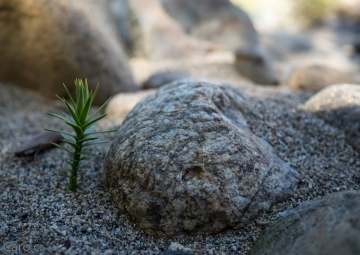 Asexual reproduction by root suckering has been reported, but it is unknown how important this process is to population maintenance and expansion. Its ecology is disturbance-driven, mainly by the effect of volcanoes, fire (both natural and anthropogenic), landslides, snow avalanches and wind and plants establishes well under the partial shade of post-fire stands dominated by Nothofagus species, or may be the initial colonist on rocky sites that have been burned. Many forests are subject to intensive human use in the form of seed collecting and animal grazing, araucaria trees are poor at regenerating, and any regeneration that does occur is principally asexual with trees sprouting from roots. In drier forests dominated by A. araucana the large mammals include Felidae such as the puma or mountain lion (Puma concolor), and foxes. Description: Araucaria araucana is an evergreen conifer that grows to 30-40 m tall and 1-1,5(-2) m in girth. It is armed with rigid sharply pointed, spirally arranged leaves. Juvenile trees exhibit a broadly pyramidal or conical habit which naturally develops into the distinctive parasol-like crown of mature specimens as the tree ages. This tree is usually dioecious, with the male and female cones on separate trees, though occasional individuals bear cones of both sexes. Araucaria araucana is the hardiest species in the conifer genus Araucaria. Because of the great age of this species, it is sometimes described as a living fossil. Big tree: A specimen 223 cm dbh (diameter at breast heightand) 50 m tall is recorded from Parque Nacional Conguillío in Chile. It is a long-lived tree and specimens over 1300 years are not uncommon in habitat. Trunk: Upright, cylindrical; bark grey-brown, resinous, smooth, very thick, wrinkled, breaking up into plates and marked by rings made by old branch scars. Branches horizontal,in whorls of 5 to 7, long, cylindrical, bearing the leaves towards their end. Lateral branches horizontal or slightly pendant. Leaves: Arranged spirally, sessile, overlapping, thick, leathery, tough, and scale-like, triangular, 2.5–5 cm long, 1–3 cm broad at the base, shiny dark-green on both surfaces, surface marked with longitudinal lines, with stomata on both faces. Blade oval-lanceolate, with sharp edges and tips. Leaves persist for 10–15 years or more, so cover most of the tree except for the older branches. Male (pollen) cones: Terminal, solitary or in groups, erecyt, cylindrical to oblong and cucumber-shaped, yellowish-brown, 4 cm long at first, expanding to 8–15 cm long by 5–6 cm broad at pollen release, with 20 whorled scales. The tree is wind pollinated. Microsporophylls acute, recurved. Female (seed) cones: Terminal, globose, 10–18 cm by 8-15 cm in diameter, maturing in autumn about 18-36 months after pollination and holding about 180-200 seeds. 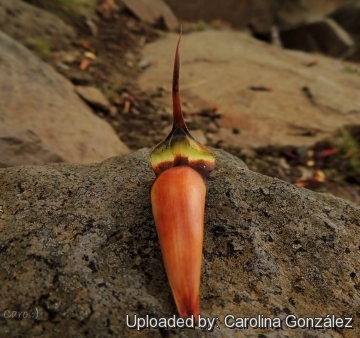 The cones disintegrate at maturity to release the seeds., scales with a long triangular recurved point. Seeds: bright brown to orangish 2.5–4 cm long and 0.7-1.5 cm across with a long narrow nut, with 2 small even wings at the top, margins denticulate at the apex. 3) Premoli, A., Quiroga, P. & Gardner, M. 2013. 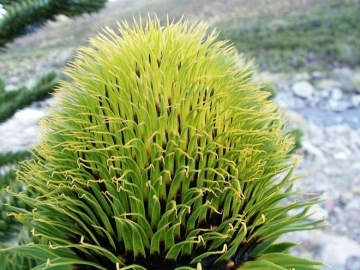 Araucaria araucana. The IUCN Red List of Threatened Species. Version 2014.3. <www.iucnredlist.org>. 6) Wikipedia contributors. "Araucaria araucana." Wikipedia, The Free Encyclopedia. Wikipedia, The Free Encyclopedia, 15 Mar. 2015. 9) Burns, B.R. 1993. 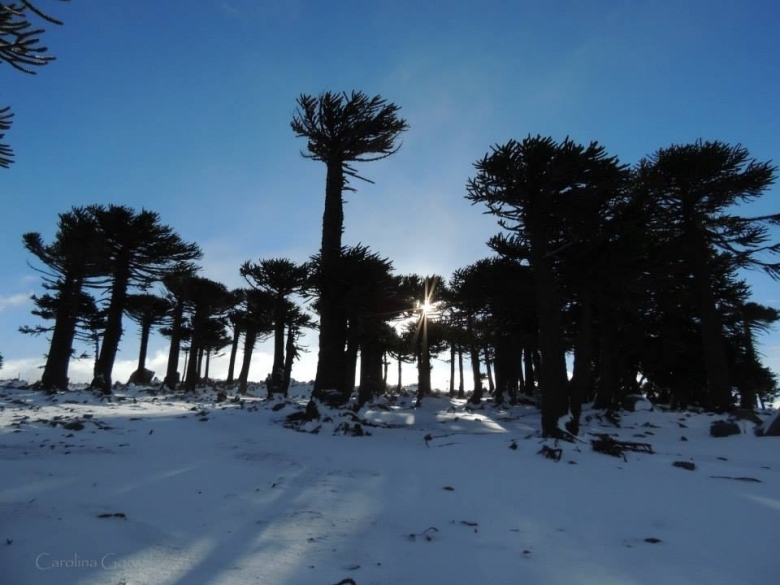 "Fire-induced dynamics of Araucaria araucana-Nothofagus antarctica forest in the southern Andes." Journal of Biogeography 20(6): 669-685. 10) Christopher J. Earle: Araucaria araucana . In: The Gymnosperm Database. www.conifers.org. Web. 15 March 2015. 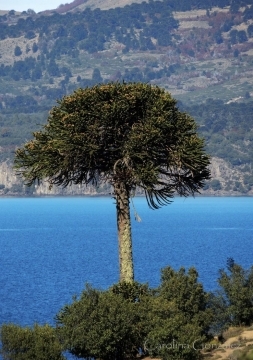 11) Encyclopedia of the Chilean Flora: Araucaria araucana http://www.chileflora.com Web. 19 Mar. 2015. Cultivation and Propagation: Araucaria araucana prefers well-drained, slightly acidic, volcanic soil, but will tolerate almost any soil type provided it drains well. No water should ever be allowed to stand around the roots. Hardiness: USDA Hardiness Zone 7, even 6b. The plant tolerates low temperatures (-15° C even -26° C), it can be covered by snow for months (1 - 8 months). Growth rate: The only inconvenience is that it grows very slowly. a. Wood: The wood is used in construction, carpentry, for shingles, floors, barrels, boat-building, paper production. Due to its listing on Appendix I of CITES there is no legal international trade in the timber; currently there is only local use in Argentina and Chile. b. Seeds (piriones): The seeds are edible, rich in proteins and carbohydrates, and were once an essential part of the diet of the indigenous people; the seeds are boiled or roasted, and their taste is similar to that of chestnuts. Today, the seeds are still eaten by local inhabitants, both the indigenous people and settlers. c. In medicine:* Antifungal, antimicrobial and antibacterial. 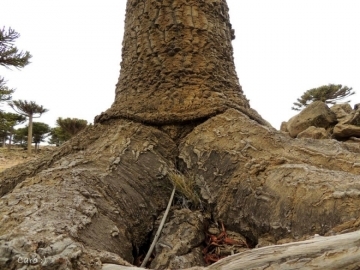 In popular medicine, the resin of Araucaria araucana used to treat ulcers and wounds, and has been shown to display a gastroprotective effect in animal models. d. Ornamental: It is also highly prized as an ornamental tree in Europe (especially throughout Great Britain) and in parts of North America. Propagation: The seeds are easy to germinate provided that they are fresh (germination capacity, over 80%). the sure way to germinate them is to soak the seeds for about two days in water, then carry out a short cold stratification (put the seeds into a refrigerator for about 10 - 15 days in humid sand), and then plant them at 20º C. Because the seeds are quite big, the initial growth (10 -12 cm.) is very quick - it takes less than 90 days from the time you soak the sees till you obtain the young plants of this size.